As a part of the Boston Big Three for five seasons, Allen and the Celtics helped put an end to the first LeBron James era in Cleveland. 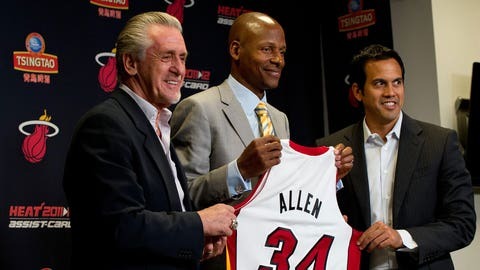 With James and the Miami Heat becoming the team to beat in the Eastern Conference, Allen turned down an offer in 2012 to remain with the aging Celtics. He played a huge role in the Heat getting a second consecutive title in 2013. It's hard to imagine Ewing as anything other than a New York Knick. But arguably the franchise's greatest player wore two different jerseys during the final years of his Hall of Fame career. After 15 seasons in New York, the 11-time All-Star was sent to the Seattle SuperSonics as part of a four-team trade in 2000. The following year, he joined the Orlando Magic for one season before retiring. There may be no athlete more beloved in the city of Houston than Olajuwon. He led the University of Houston to the NCAA title game in 1984 and won back-to-back NBA championships in the mid-90s with the Houston Rockets. 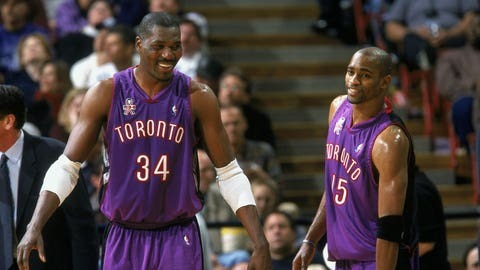 But as part of the team's rebuilding process, Olajuwon was traded to the Toronto Raptors in 2001 where he played the final season of his career. 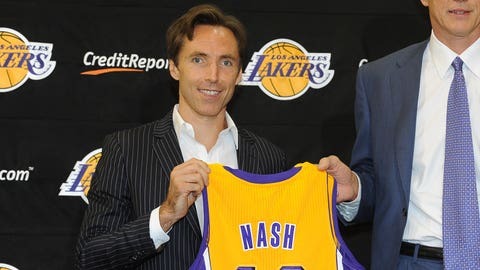 Nash spent 10 seasons with the Phoenix Suns battling the Los Angeles Lakers in the Western Conference. Because of that rivalry, he said early the next summer, 'For me, it would be hard to put on a Lakers jersey.' Not long afterward, he was putting on a Lakers jersey, the result of a sign-and-trade deal that created a Hall of Fame-bound backcourt of Nash and Kobe Bryant. But joining a star-studded Lakers team turned out to be an epic failure. 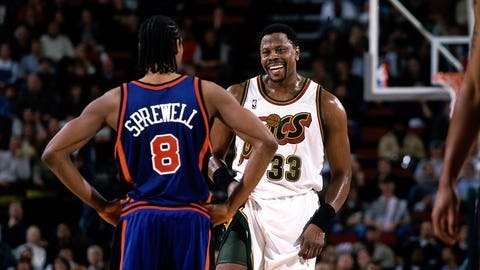 Payton (20) re-wrote the record books with the Seattle SuperSonics for more than a decade, and Malone (11) was a dominant force with the Utah Jazz. But their legendary careers with the teams that drafted them did not include a championship. 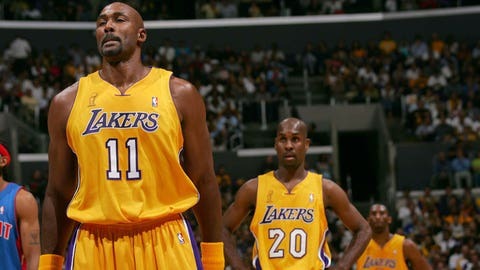 The two joined a loaded Los Angeles Lakers team in 2003 with hopes of getting their first ring. However, their one-year quest together was crushed by the Detroit Pistons in the NBA Finals. Iverson was so beloved in Philadelphia for most of his career, it was hard to imagine him going anywhere. But the 2001 NBA MVP had a long falling-out with the franchise and requested a trade in 2006. 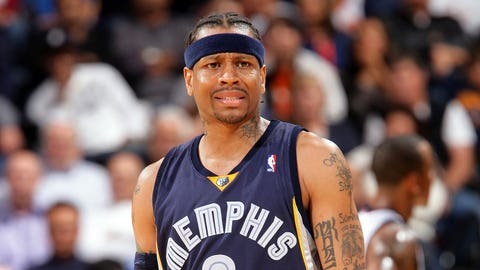 After brief and unsuccessful stints with the Nuggets, Pistons and Grizzlies, Iverson made an emotional return to Philly, where he wrapped up his NBA career in 2010. 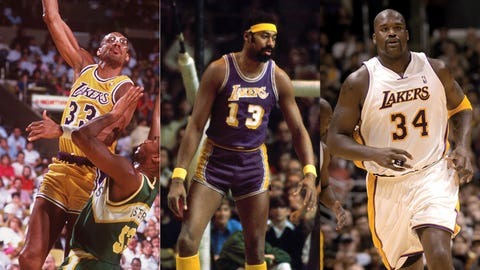 Great centers don't come along very often, so it's not easy for any team to let one get away. Abdul-Jabbar turned the Milwaukee Bucks into a powerhouse early in his career, winning the franchise's only two conference championships and lone NBA title. But after six seasons, he requested to be traded to New York or Los Angeles, where he was more of a fit culturally. Chamberlain had also felt he was more suited for the West Coast lifestyle and wanted out of Philadelphia in 1968. Like his predecessors, Shaq elected to join the Lakers in the mid-90s after five seasons with the Orlando Magic. Durant made Oklahoma City crazy for basketball. He led the Thunder to the NBA Finals in 2012, and won league MVP in 2014. 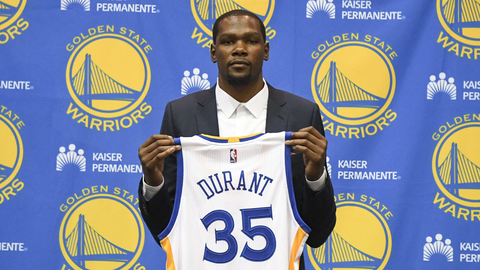 After a frustrating finish to the 2015-16 season, which OKC let a 3-1 series lead slip away to the Warriors in the Western Conference finals, Durant was still hungry for a championship. So rather than continue the journey with the Thunder, he left for Golden State where he won a title in 2017. It was heartbreaking for Cleveland fans when LeBron left for South Beach in 2010, but he came back home to finish what he started. 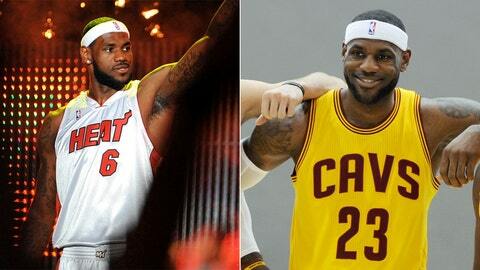 Four consecutive trips to the NBA Finals and back-to-back championships weren't enough to keep him in Miami. He didn't win "not three, not four, not five, not six ...." with the Heat as promised. LeBron saw a brighter future in returning to Cleveland in 2014 and led the Cavs to their first championship in 2016. 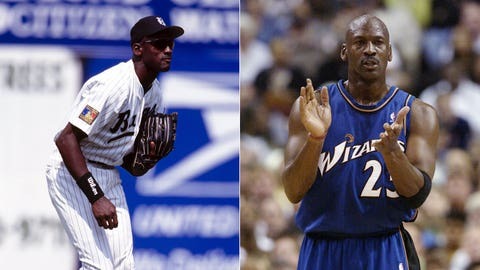 Changing NBA jerseys is shocking, but switching to a baseball jersey is an even bigger surprise. Fresh off three consecutive NBA championships, Jordan was on top of the world in 1993. But personal issues led to his unexpected retirement and desire to play baseball. He returned to the court in 1995 and retired again after his second three-peat. The five-time league MVP made a comeback with the Washington Wizards before hanging it up for good in 2003.